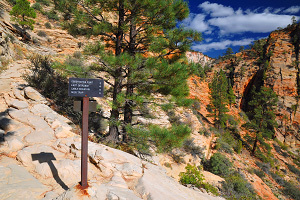 Most people are familiar with the lower section of the East Rim Trail that leads to Hidden Canyon and the Observation Point Trail, but few people hike the 11-mile long East Rim Trail in its entirety. 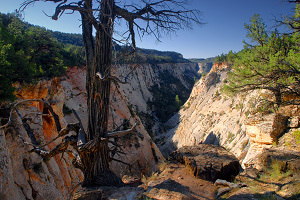 Though usually compared unfavorably to its bigger brother (the West Rim Trail), a day hike along the East Rim Trail takes one through some wonderful scenery from the East Entrance through Echo Canyon down to Weeping Rock in the main canyon. Rating: Fairly strenuous longer day hike. Elevation Change: a gradual 1000-ft gain from the East Entrance to the upper plateau, then a 2400-ft descent through Echo Canyon to Weeping Rock. Seasons: Year-round, but any significant snow or ice in winter could pose a problem. Starting at the East Entrance Trailhead, the East Rim is a very well-defined sandy trail that heads north into wonderland of the White Cliffs as it makes its gradual ascent to the top of the plateau. 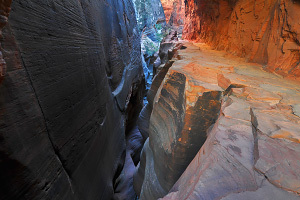 If you catch this stretch of trail during sunrise, it is a special experience; the section of trail in Cave Canyon is the most quiet corner of Zion. The first few miles of this trail are quite child-friendly and might make a nice leisurely stroll if you intend to hike only a few miles and then turn around. After an open section of sagebrush, the East Rim Trail reaches the edge of Echo Canyon and begins a dramatic descent into slickrock wonderland. This section of trail has a few exposed spots, so be more cautious here, especially in wet or snow conditions. After descending roughly 1000 feet to the floor of Echo Canyon, the trail crosses over the drybed and now crosses many sections of slickrock where only cairns show the way. (Warning: While navigation is fairly easy in daylight, this would be an extremely difficult section to navigation in darkness, even with a headlamp.) As the Echo Canyon slot gets deeper and deeper below to the left, the trail finally joins up with the main East Rim/Observation Point Trail. Once on the main paved trail, you will feel like you are suddenly out of the wilderness as you bump into the multitude of people hiking to and from Observation Point. Now it's a simple, but knee-breaking task to follow the paved trail as it rapidly descends another 1200 feet out Echo Canyon and down into the main canyon. Once out of Echo Canyon, you get a great view of Angels Landing across the way and you will pass the spur trail to Hidden Canyon to end up at Weeping Rock. East Entrance to Stave Spring. Stave Spring to Weeping Rock. This fairly strenuous one-way hike is probably the most enjoyable way to do the East Rim Hike. Total distance is roughly 11 miles and can take anywhere between 5-9 hours, depending on how leisurely you hike. The scenery starts out quite sublime in the east canyon, then after hiking several miles on the plateau, the scenery becomes spectacular as the clever trail wanders through the beautiful slickrock formations of Echo Canyon and then makes its final descent to the Grotto Trailhead in the main canyon. If you are a fast hiker in good shape, a side trip to Cable Mountain or Deertrap Mountain is possible. For those looking for a shorter, less committing route, the hike from the East Entrance Trailhead to the head of Jolley Gulch (shown on the map) is a good excuse to see some beautiful scenery without having to work too hard. Round-trip time: 2-4 hours. This stretch of trail is mostly child friendly, but the area around Jolley Gulch has some sheer cliffs. Starting at either the East Entrance or the Grotto, a multi-day hike along the East Rim would allow more time to soak in Cable Mountain and/or Deertrap Mountain. While the hike up from the Grotto would be more scenic, the uphill is much more strenuous. A permit is required for any overnight, but there are no designated campsites. See backpacking information below. The Trans-Zion Trek is a 47-mile multi-day multi-trail hike that spans the entire park. The East Rim Trail is typically the final leg of the epic route from the Kolob Section to the East Entrance. Unlike most other areas of the park, camping is permitted on the East Rim, Cable Mountain, and Deertrap Mountain, except within Echo Canyon. A wilderness permit is still required for any multi-day hike; pick up your permit at the Zion Wilderness Desk or at the Kolob Visitors Center. (See the official Zion Backpacking page for more info on permits.) You must camp well out of sight of the trail, away from the rim, and away from any water sources (springs). One good area for camping is the large grove of ponderosa pines just northwest of Stave Spring near the trail junction, and any good spots found along the Deertrap Mountain Trail will afford you wonderful solitude. Admittedly though, the East Rim is not the most idyllic place to camp as the terrain is mostly hot, sandy, and exposed, and camping opportunities elsewhere (West Rim Trail, La Verkin Creek Trail, etc.) are much more appealing. Camping in this area is only an interesting option if you want to spend a good amount of time exploring Cable Mountain and Deertrap Mountain or you are doing the last leg of the "Trans-Zion" Hike. The trailhead is located just west of the East Entrance ranger station along Route 9 in the upper East Canyon. Follow the short dirt road to the parking area. If you are planning on doing the one-way hike to the Grotto, it may be preferable to arrange a drop-off or pay one of the Springdale outfitters for shuttle service to the trailhead. If doing a day hike, bring your own water. For backpackers, Stave Spring is located on the East Rim Trail a few hundred feet southeast of the Cable/Deertrap Spur Trail. Look for the pipe on the south side of the trail. Flow can be quite low during the dry months, so check conditions with the Wilderness Desk before your hike. With its relatively long mileage and not-so-exciting stretch across the brushy plateau, the East Rim Trail is not a hike that the general public would be interested in. But I still consider the one-way East Entrance to Grotto hike to be a "classic" and one of my favorites. From the tranquil start in the east canyon to the awe-inspiring stretch through Echo Canyon, and the majestic finale down into the Main Canyon, this hike has some truly beautiful scenery!